The diesel-powered Project 22160 Patrol Ship is designed for border guard and patrol service in territorial waters, patrolling 200-mile exclusive economic zone in blue waters; suppressing smuggling and pirate activities; rescue operations; environmental monitoring. In wartime – defense of ships and vessels at sea, as well as naval harbors and water areas with the purpose of alerting hostile attacks. Owing to its modular design the ship could be re-tasked in short order to perform a range of duties. The Russian Navy plans for the procurement of six boats by 2019. On 26 February 2014, the PHC «Zelenodolsk plant named after A.M. Gorky» (incorporated by the JSC „Ak-Bars“ Holding Company») hosted a grand ceremony of keel-laying of the lead patrol ship of 22160 project designed by the Severnoye Design Bureau JSC. This state-of-the-art ship is designated for protection of the territory waters, patrolling of economic zones at open and enclosed seas, suppression of contraband and pirate activity, search and rescue operations during accidents at sea, environmental monitoring, for protection of ships and vessels along their sea routes, as well as for alert about dissimilar forces attacks and about informing of the military means of the enemy. The Director General of the PHC «Zelenodolsk plant named after A.M. Gorky» Renat Mistakhov, Prime Minister of the Republic of Tatarstan Ildar Khalikov, Commander in Chief of the Russian Navy Admiral Viktor Chirkov took part in this ceremony; together with the Director of Division on State Defence Order of the Russian Federation Ministry of Defense Andrey Vernigor, Deputy Ministry of Industry and Trade of the RT Ildar Mingaleev, Director General of the JSC „Ak-Bars“ Holding Company» Ivan Egorov, the Head of the Zelenodolsk Municipal area Alexander Tygin, Director General of Severnoe Design Bureau JSC Vladimir Spiridopulo and the representatives of subcontractors and other guests took part in the event. During his speech on the ceremony of the ship keel-laying the Prime Minister of the RT Ildar Khalikov thanked all plant employees for their work, and the Navy management — for the attention to the enterprise and its products. «The fact that you are here today demonstrates your attitude towards the plant and its projects», — said Ildar Khalikov addressing to the representatives of the Russian Navy and the Commander in Chief of the Russian Navy Admiral Viktor Chirkov. Ildar Khalikov has also emphasized that the plant has a state order, which means that „the enterprise has today, tomorrow and the great future“. In turn, the Commander in Chief of the Russian Navy Viktor Chirkov stated that the patrol ship of 22160 project is one of the first ships constructed using new technologies. Generally, according to him the fleet shall solve the main task: provision of the safety of our country. Thus, during Winter Olympic Games in Sochi the ships built at the Zelenodolsk plant provided the security of the Games. On 08 May 2016 at the Zelenodolsk Plant named after AM Gorky ceremony of laying of the fourth patrol boat project 22160. The ship was named "Sergei Kotov," in honor of the Black Sea katernika Hero of the Soviet Union Sergei Nikolaevich Kotov. 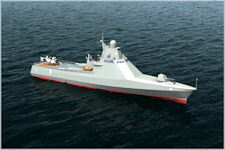 Total Zelenodolsk planned to build six ships of this project, and they will become part of the Black Sea Fleet. Analysts emphasize that the ship was created on the principle of modularity and can change weapons depending on the combat mission: fighting piracy or conducting strike operations at sea. In addition to the 57-mm AK-147MA artillery installation, machine guns and the anti-sabotage grenade launcher complex DP-65, as analyst Tyler Rogovie notes, there is free space on it that can be used to accommodate two Caliber-K missile systems. This allows striking eight missiles at once at sea and land targets. Russia has Buyan-type corvettes — especially cruel small ships that have demonstrated their ability to launch long-range cruise missiles across Syria from the Caspian Sea for the first time in 2015. But the modularity and air defense capabilities of Project 22160 ships are particularly attractive, as are their work in the open ocean for long periods of time. In the expanded version of the project 22160 the ship has a vertical launcher of the rocket complex "Shtil-1", which is located between the captain's bridge and deck gun. The complex carries up to 20 9M317ME missiles. This concept is innovative enough to be studied in the western naval forces. It can serve as a source of inspiration for their multifunctional combat ships. In addition, the patrol ships of the modular type of the far-sea zone of the project 22160 will be in demand on the world arms market, especially in Vietnam and Algeria.